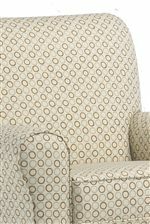 With a unique design, this upholstered swivel chair brings an updated look to your child's nursery. 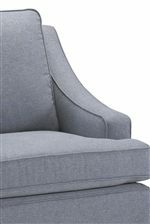 Its tall dressmaker skirt and swooped track arms are soft yet striking, while a reversible seat and loose back cushion provide superior comfort and support. Pair with its matching ottoman for head-to-toe relaxation and coordinating style. 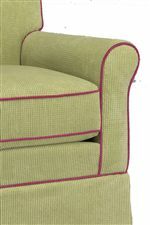 Available with contrast cording option. The Storytime Swivel Chairs and Ottomans Ayla Swivel Chair with Swooped Arms by Best Chairs Storytime Series at Best Home Furnishings in the St. Louis, Chesterfield, St. Charles, MO & Waterloo, Belleville, Edwardsville, IL area. Product availability may vary. Contact us for the most current availability on this product. The Storytime Swivel Chairs and Ottomans collection is a great option if you are looking for Contemporary furniture in the St. Louis, Chesterfield, St. Charles, MO & Waterloo, Belleville, Edwardsville, IL area.